The news didn’t come in the middle of the night as we expected, but in the morning, at a reasonable hour EST. 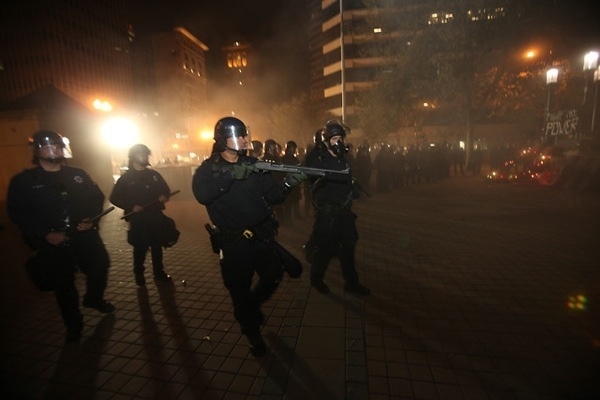 Hundreds of riot cops had raided the encampment at Oscar Grant Plaza, wildly swinging their batons and firing tear gas and beanbag rounds into a crowd made up of our friends, comrades, and allies who had for the last two weeks taken over and transformed dead space into the Oakland commune. Our initial reaction was outrage, an intense hatred of the police and all those who look away, who justify their actions, who volunteer platitudes like, “They’re just doing their job.” Anger rose up inside of us. How could they—we growled indignantly, clenching our teeth—shoot teargas at innocent protesters? What could possibly justify this show of militarized force? Is this really what democracy looks like? And then we took a step back and started to think about outrage. To feel outrage, we must hold that there are appropriate channels through which social conflict can be mediated and resolved. We must see the state as accountable to our needs and desires, effective and efficient in its provision of necessary services. We must forget that we are privileged, that in our privilege we are just like everyone else. That those who experience state terror at the hands of the police somehow deserve it. To feel outrage, we must believe that violence is the exception. But it isn’t. Accountability is nothing more than a gilded myth: as the “Occupy” movement has recognized, the 1 percent has so taken hold of the political system that politics as such can no longer be said to exist. We are living under the rule of austerity capital. There will be no more necessary services, just as there is no more accountability. In Detroit, we know there’s no going back to that golden age of the welfare state, of union jobs, of a “comfortable” middle class life. Those jobs, and their conditions of possibility, are long gone. And even if we could, would we really want to return to a system that depended on the institutionalization of war, sexism, and racism to reproduce itself? These days, in any case, Michigan is cutting off welfare payments to those who’ve been unable to find work for four years and canceling programs that help poor families pay their heating bills in the winter. And winter, forecasted to be one of the coldest on record, is fast approaching. To feel outrage is to give ourselves away. For those who face the brutality of the police every day of their lives, those who are stopped and frisked on the street, those who are arrested for inhabiting the wrong neighborhoods and the wrong skin color, those whose family members have been stolen by the prison-industrial complex, understand that the police are the foot soldiers of capital. To serve and protect—the 1 percent. So. We have to smother our outrage, train ourselves to recognize the police for what they are, both rationally and affectively. It is only when we no longer feel outrage that we will be able to move beyond a reactive politics which traps us in endless cycles of legal battles, jail support, and internal investigations that never lead anywhere worthwhile. We must expect them. What Boston, New York, Atlanta, and especially Oakland have taught us is what we should have already known—that the cops are coming for us. All we can do is learn to defend ourselves, to move quickly. And to attack first. At the march on Bank of America last week, which started from the occupation at Grand Circus Park and moved through downtown Detroit on a bright crisp fall day, we found ourselves astonished. Not at the 500 plus persons filling the normally deserted streets, not at the palpable joy in the air (the joy of realizing that we were no longer alone in trials and fears in this age of austerity, and the joy of finding a long-longed for family, filled with true care and love). Rather it was one moment, brief, and in the context of the brilliant and massive amount of organizational work that has occurred in the last two weeks perhaps easily overlooked: at one point in the march the police decided to intervene, to test us, and tried to force the march onto the sidewalk. They shouted threateningly, their cars darted at marchers, they revved their engines menacingly, but at the front of the march a man, holding his young infant daughter faced the police and refused to leave the street. He refused. He would not be moved. And in the face of his resolve the police relented, and the march followed him, shouting, singing, laughing in the streets. His eloquent gesture said two things: this space is occupied and it is ours. If our movement is to become worthy of the name, we will have to learn two lessons. First, to be against outrage and the exceptionalism that it entails. From the state and the cops, we expect nothing but what they have already shown us: tear gas, rubber bullets, armored vehicles, all the technologies of foreign wars come home. 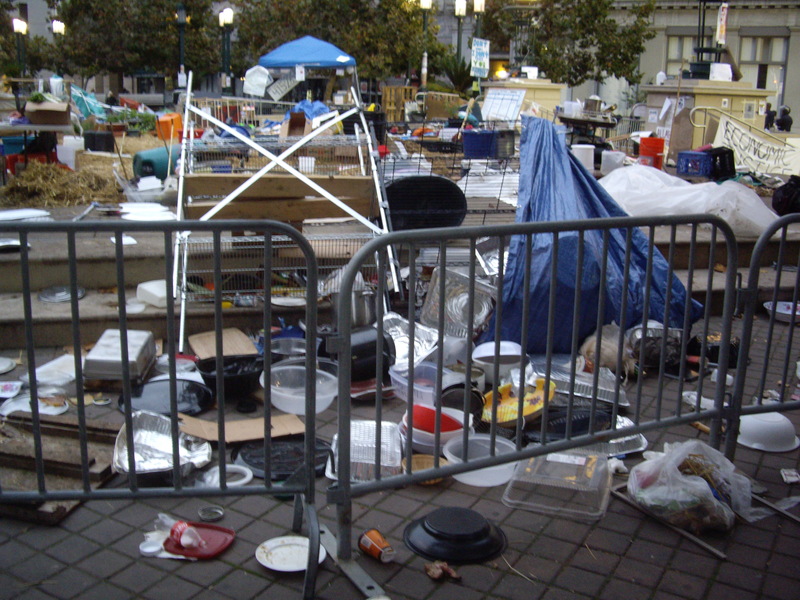 And second, that occupy means to take and to hold space; that first we take a park, then the street, then the schools, then the banks, until what was built by all of us truly belongs to all, no gods, no masters.